Special effects: fine purple mica background. This print is a 60th anniversary commemorative edition, sanctioned by Goyō’s family, and published in December 1981. Brown, Kendall H., Putney, Carolyn M., Shūko, Koyama, and Binnie, Paul (2013). Fresh Impressions: Early Modern Japanese Prints. Toledo: Toledo Museum of Art. Jansen, Marije (2016). Japan modern. Japanse prenten uit de collectie Elise Wessels. Amsterdam: Rijksmuseum. Marks, Andreas (2015). Seven Masters: 20th Century Japanese Woodblock Prints from the Wells Collection. Minneapolis: Minneapolis Institute of Arts. Narazaki, Muneshige, ed. (1990). Ukiyo-e Masterpieces in Western collections. The Robert O. Muller Collection. Tokyo: Kodansha International. Newland, Amy Reigle, and Uhlenbeck, Chris, Eds. (1990). Ukiyo-e to Shin Hanga. New York: Mallard Press. Newland, Amy Reigle, and Shinji, Hamanaka (2000). The female image. Leiden: Hotei Publishing. Newland, Amy Reigle, ed. (2004). Printed to Perfection. Twentieth-century Japanese Prints from the Robert O. Muller Collection. Amsterdam: Hotei Publishing, in association with Sackler Gallery/Smithsonian Institution. Stephens, Amy Reigle (1993). The New Wave: Twentieth-century Japanese Prints from the Robert O. Muller Collection. London: Bamboo Publishing. The Toledo Museum of Art, Ed. (1930). A special exhibition of modern Japanese prints. Ohio: Toledo. Uhlenbeck, Chris, Newland, Amy Reigle, and de Vries, Maureen. (2016). Waves of renewal. 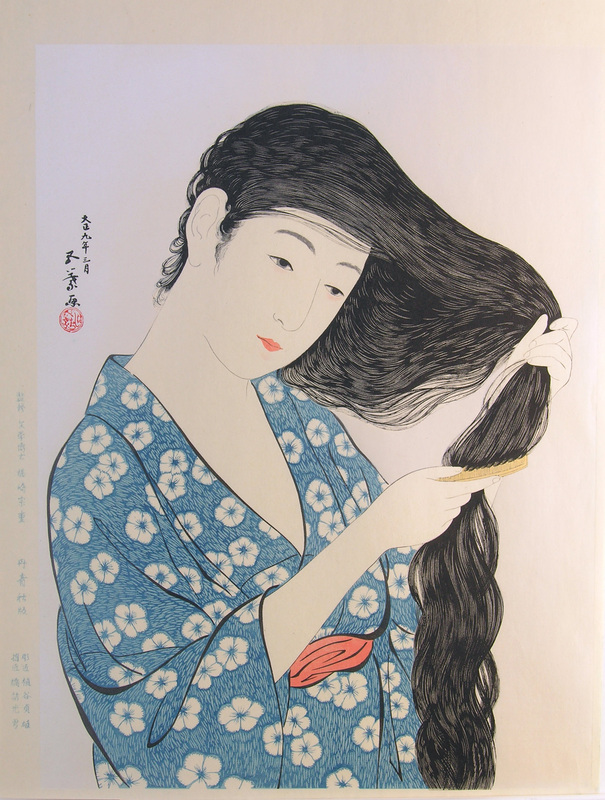 Modern Japanese Prints, 1900 to 1960. Selections from the Nihon no hanga collection, Amsterdam. Leiden: Koninklijke Brill NV. Provenance: A shop in the Kanda district of Tokyo, and thanks to the wonderful help of David Bull who also translated the kanji concerning editor Narazaki Muneshige for me on this print.